Water is cheaper in California than you might think. Just as it is in most of the United States, it's less than a penny a gallon. That is because water is delivered to residents exactly at cost. There are no extra fees or charges on this vital resource. This raises a big question. With prices so low, how can the state make residents value water more and conserve it? Gov. Jerry Brown and state regulators are trying to get people to cut back with mandates and fines -- the stick approach. But a startup in Oakland called MeterHero is trying to change the value of water a different way -- with carrots. Like me, you probably waste gallons and gallons of water. For instance, when you let the tap run for the shower to warm up. Yup, we just let all that water go right down the drain. But not Alice Green. Green says she learned the value of water during the massive drought. No, not this drought -- the one back in the '70s. Today she saves her shower warm-up water and uses it to flush her toilet. 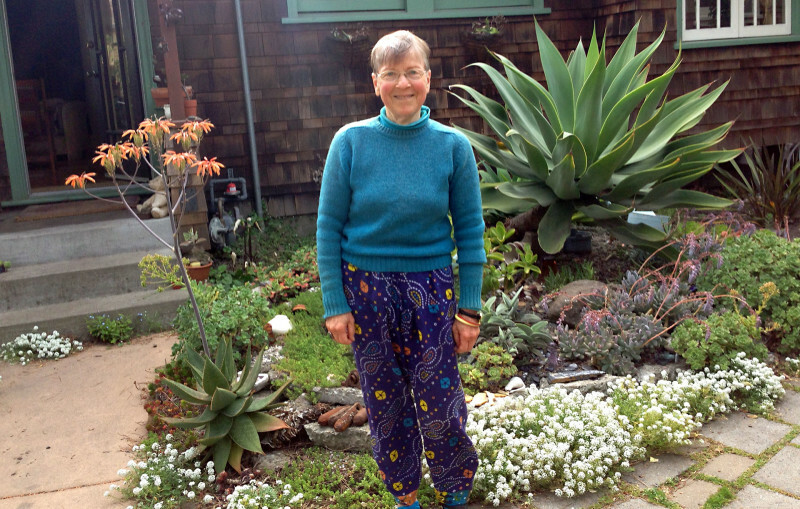 She also has a drought-resistant garden instead of a lawn. Most people in the state are not as water-conscious as Green. She says many do not realize the value of water because it is so cheap. MeterHero agrees and wants to change that, but not by raising the price of water. Instead, it wants to give rebates. Here's how it works: Water customers give MeterHero access to their utility accounts online. MeterHero tracks current usage and gives rebates to those who use less than they did before -- $1 for every 100 gallons conserved. The rebates give some extra value to water and create a tangible incentive for using less. Green’s Berkeley cohousing community, which is like a hippier version of a condo complex, has signed up for MeterHero. Her neighbor, Raines Cohen, says the residents in the 14-home community were already working hard on conserving and have cut back nearly 1,000 gallons a day from their total usage a couple years ago. That level of conservation would net them $3,650 a year in rebates. “We can see if we can keep that up, but we now have a strong incentive because of rebates,” Cohen says. Are the rebates enough to make people cut back their water use? We don't know, says MeterHero founder McGee Young. What is really innovative here, Young says, is establishing these tangible rebates and a marketplace where they can be exchanged. He says the price may eventually fluctuate based on the demand of the market -- basically, how much companies will pay to sponsor these rebates. This raises the question of who is going to sponsor them. MeterHero is currently funding the rebates, but the startup is trying to partner with outside companies. It is in touch with some businesses that see sponsoring rebates as a PR opportunity, a way to show they are conserving water in drought-ridden California. The startup is also working with companies that sell water conservation products. For those businesses, the rebates would be a way to connect with water-conscious consumers and sell them things like low-flow showerheads and fake grass. “The biggest challenge these companies face is actually connecting with customers,” Young says. Right now MeterHero, which also allows people to track gas and electricity use, is just getting started and has signed up 400 water rebate participants. It has given away $5,000 in rebates, which equals 500,000 gallons of water. That does not even make a dent in the state's usage. Water experts say big cutbacks usually come from less flashy and popular things than rebates -- such as rewriting building codes. Last year, California limited new toilets to 1.28 gallon flushes, which is expected to save billions of gallons of water a year. The idea behind these water rebates is similar to carbon credits. Maybe in the future there would even be some kind of cap-and-trade system. If the price goes high enough, someday we might start thinking twice about all that water we flush down the toilet. Editor's note: This story has been revised to add details of how MeterHero works and the number of people signed up for the service. The story has also been edited to clarify the conservation achieved by the Berkeley cohousing group mentioned above.